8-Year-Old: Mom? What’s for dinner? 8YO: Mo-om! What’s a bean cake? [Pause.] I’m not eating a bean cake. Mom: Ok, you don’t have to eat them. [Blase, casual.] You know there is always something on the table that you’ll like. 8YO: [Somewhat taken aback by lack of engagement.] OK.
8YO: Do I have to eat a bean cake, Mom? 8YO: Maybe I’ll try a bite. But only a bite. 8YO: Fine. I will only have two whole bean cakes if I can have sour cream on them. Soak dried beans in water overnight. Or follow instructions on bean package for quick soak. Drain and rinse beans. In a medium saucepan, cover them with water. Bring to a boil and cook, over medium high heat until tender, 45 minutes. Set aside 1/4 of the beans. In a food processor, combine the rest of the beans with eggs, cheese, celery, parsley, scallions, lemon zest. Pulse to make a rough paste. Remove to a medium bowl. Mix in bread crumbs, olive oil, Tabasco, salt, pepper and reserved whole beans. Stir lightly to combine all ingredients. Heat oil in a skillet over medium-high heat. Working in two batches, pat the cakes with flour and brown the cakes in the pan, cooking until they are browned, about 3 minutes. Flip and cook another 3 minutes. Repeat with remaining patties. Serve with sour cream, chopped chives, and orange sweet potato mash (bel0w). Bake 2 medium sweet potatoes at 425°F for 40-45 minutes. Slice and scoop out flesh into a bowl, add 2 tablespoons butter, about 1 tablespoon orange juice, salt and pepper, and mash with a fork (I use a beater attachment from a handheld mixer) until smooth. This looks great, I’ll add these to the menu next week. Always looking for a vegetarian dish that is quick. Thanks! P.S. Loved my bumper sticker…too cute! I love Hominy Grill….specifically the hummingbird cake!!! sounds awesome!! 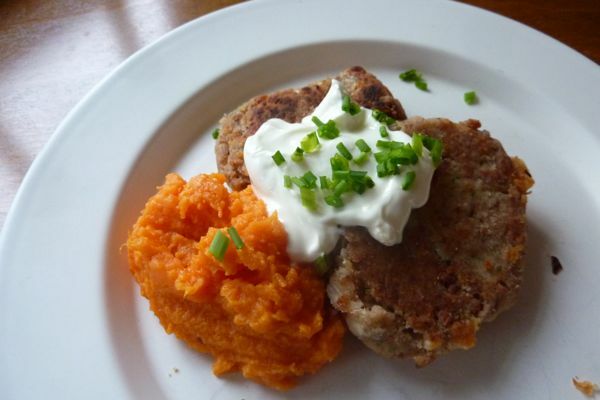 i love bean burgers – especially with lots of sour cream!! love your blog. makes me happy. The dialogue is spot on! Do you think you could use canned beans instead? could i make these with canned pintos, ya think? loved the play; Phil would benefit by the lessson imparted. I tried it with canned beans. It was delicious. Thanks for sharing. How much canned beans did you use? Thank you so much for posting this recipe … they are AMAZING! I made it tonight with a can of pinto beans. I followed the recipe with a few tweaks. I used cilantro instead of parsley because that’s what I had and I added a little grated garlic. The one can of beans yielded 5 cakes which was enough for my husband and me … my kiddos don’t do beans :-(. I am truly enjoying your blog … you’ve inspired me to cook new things again. Just wanted to let you know that I finally got around to making these tonight and they were so good. My almost 4 year old took one look at them at the table and said, “I don’t like beans”. Then she proceded to eat a whole patty. Success! Pou montre li itilize nan dwog oswa medikaman yo ka diferan analiz toksik fet.